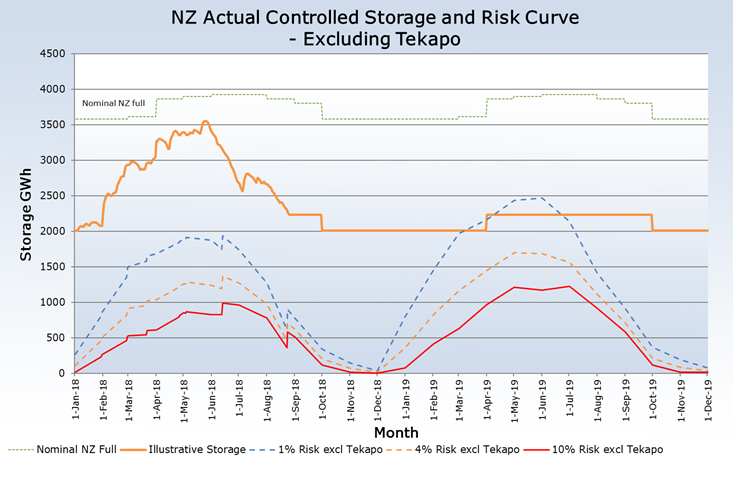 The graphs below compare New Zealand and South Island controlled storage to the relevant Hydro Risk Curves. As at 14 April, New Zealand and South Island controlled storage is above average. The risk meter for the New Zealand and the South Island is set to Normal. Since December 2018 when preparing the Hydro Risk Curves (HRCs), we have included an additional step to validate the thermal fuel consumption in the HRC modelling in light of known constraints to fuel supplies. This step was added to the process following consultation earlier in the year; please see here below for more information on the consultation. The verification step involves an assessment of thermal fuel consumption in near term HRCs (current month plus next month), and assesses this consumption against the available fuel supplies. Available fuel supplies are determined using information provided by key stakeholders, and represent the amount of gas that could be provided in an emergency situation. Our process has been to first determine available natural gas using historical production values and coal supply using information from Genesis. Following this we have taken out the amount of natural gas we do not believe to be substitutable during an emergency (i.e. gas that would not be made available even in an emergency situation, for example residential gas consumption). This residual value is then compared against gas required in the HRC model (accounting for the use of available coal supply). Based on the validation completed in the December update of HRC's we believe there will be sufficient thermal fuel made available during a security of supply emergency such that generation output is consistent with our modelling assumptions, should an emergency arise. This is not based on existing contractual arrangements, but arrangements be believe would be put in place in an emergency. We have only assessed near term HRCs as any longer term assessment requires knowledge of future market behaviour, including generation assumptions and fuel supply arrangements. We do not believe it practical to model this in an objective and robust way, and therefore the assessment of thermal fuel consumption is limited to near term HRCs, and it is assumed that in the long-term (3-24 months) there will be no thermal fuel constraints. Some of the detailed information that this verification step utilises is commercially sensitive, and therefore we cannot disclose the specific assumptions we have used, but section 2.5 of the Hydro Risk Curve Input Assumption Document details the thermal generation assumed in the model. In late-2017 we received information from Genesis Energy regarding a potential limitation of thermal fuel availability. This prompted a review of the treatment of thermal fuel, and specifically potential thermal fuel limitations, in the HRC Input Assumptions. We have finished this review and have decided on a modified process for the treatment of thermal fuels in the HRC assumptions, described in the document below. On 1 April 2019, we held an industry teleconference to discuss the treatment of thermal fuels in the HRCs. A summary of this teleconference is included below. In June 2018, we sought feedback on the proposed treatment of thermal fuel information with respect to the HRC assumptions, as required by clause 6.3 of the Security of Supply Forecasting and Information Policy [ pdf 425.37 KB ]. The feedback to this consultation will be uploaded here in the coming weeks. In December 2017 we sought feedback on the way in which thermal fuel has historically been treated in the Hydro Risk Curve modelling. Feedback was sought as changing the input assumptions would materially impact the HRCs. 220 GWh of controlled storage at Lake Tekapo is classified as contingent storage from 1 October to 31 March. This contingent storage only becomes available once reported controlled storage falls to the 4% risk curve. The Hydro Risk Curves (HRCs) are being adjusted to exclude this contingent storage at Lake Tekapo to align with the SoSFIP. As a result of this adjustment, HRCs from January to March as well as in October will decrease, while HRCs in other months will increase. For example, the 10% HRC will increase by a maximum of 213 GWh in September and decrease by 144 GWh in March. It is important to note that reported storage will be 220 GWh lower from 1 October to 31 March – this effect is illustrated below. The reported nominal full values have also been adjusted accordingly. The change to reported storage from 1 October to 31 March offsets the decrease in the HRCs from January to March (and October), and as such the net impact is to effectively increase the HRCs for all months. That is, while the HRCs have decreased, reported storage will be decreased by a greater amount. We appreciate that one consequence of this change is to increase the complexity of the Hydro Risk Curves, and as such we are readily available to discuss with anyone should they require further clarification or information. Please contact Bennet Tucker if you require further information using bennet.tucker@transpower.co.nz.